​Apex Legends Twitch Prime pack was announced Tuesday by Respawn Entertainment. Players who have Twitch Prime, and who successfully linked their account to Twitch, will receive exclusive loot -- including a legendary Pathfinder skin. 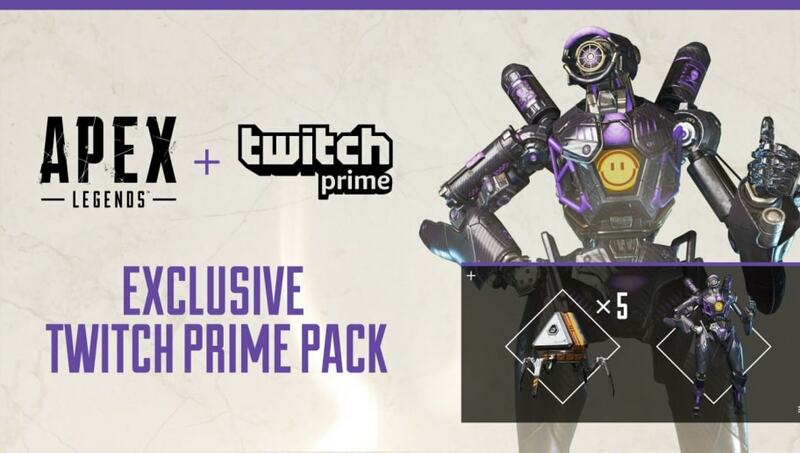 Fans of Apex Legends who coincidentally have a Twitch Prime account will be rewarded with exclusive loot in the Apex Legends Twitch Prime pack. Respawn announced the new pack through its Apex Legends Twitter, announcing players have the opportunity to unlock five Apex Packs and the legendary Omega Point Pathfinder skin. Players ​need to have Twitch Prime and will have to link their EA account to Twitch in order to receive the loot. They can link their PC or console to EA ​through the EA website. If players have multiple Apex Legends accounts linked to one EA account (a PlayStation 4 account and a PC account, and so on) the first account they log into after claiming the Twitch Prime loot will receive the Apex Packs and Pathfinder skin. Apex Packs are the equivalent of loot boxes in Apex Legends. ​Opening up Apex Packs will give players the chance of ​obtaining an Heirloom set, which are a secret tier of rare cosmetic items -- even higher than legendary.